First Line: Blight County Idaho Sheriff Bo Tully scanned the ridge above him. Sheriff Bo Tully and his deputy are up in the mountains tracking a bank robber when they witness a man being shot and killed from long range. Tully quickly calls for "Lurch," his trusty one-man crime scene investigator, but now he has to figure out if this death is tied in with the bank robbery... and what's up with those two elk hunters who don't seem to know beans about hunting elk? A local named Gridley Shanks seems to have a lot of connections-- not only to various doings in and outside of town-- but with the bank robbery and the murdered man. Has he got something to do with this business? Once again, it's up to Tully and his Blight Way of investigating crime to put all these bits and pieces together to figure out who needs to go to jail. If you're the type of mystery reader who sometimes prefers your murders to be served up with a smile-- and if you're caught up with all of Craig Johnson's Longmire books-- let me recommend Patrick McManus's Sheriff Bo Tully series. They don't necessarily have to be read in order, but some of the characters and events might be a bit clearer to you if you do. Sheriff Bo Tully is a man who always has an eye for the ladies, and for the most part the ladies of Blight County have just as much fun as Bo does. But Bo is really a crime-solving natural who uses his in-depth knowledge of the area and its inhabitants to close his cases. His investigations often delve into the history of the area a little as well, which brings a bit of the Old West into the story. 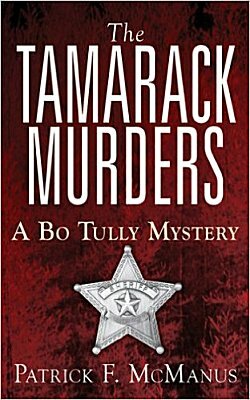 As in other books in the series, Bo tends to be a couple of steps ahead of readers and the other characters in The Tamarack Murders, something that usually annoys me in other mysteries, but it doesn't here. Bo is one savvy sheriff, and it quickly becomes apparent that his attempts to remain those two steps ahead are mostly to prevent any harm from coming to his team. Down-home humor plays an important part in the book, and a little old lady named Vera steals the show from Bo. Her scenes alone are well worth reading the book. If you like mysteries that are light, fun, and quirky from first page to last, I think it's time you introduced yourself to Bo. But be warned: if you're female, this here sheriff is a dyed-in-the-wool lady's man. This is a series I'm not familiar with, Cathy, so it's nice to know about it. And good to know you think it's worth exploring. Sometimes those lesser-known series can be hidden gems.